collegebound works as a everything under the sun!. MegNeoNurse has 4 years experience and works as a Registered Nurse. Yeahhh, unfortunately that sounds about right. Fortunately, alot of the books can be used throughout nursing school (Medical dictionaries, careplan book, NCLEX-RN review, drug book). So, somehow, it's kinda worth it. Plus it's stuff you will reference throughout, or so I'm told. Our school has this contract with Elsevier and we got alot of the books that we bought on a CD as well (so we can just bring laptops to class instead of lugging 4 18lb books every lecture). michar works as a EMS and Photographer. Our first semester our books were $1200. We had a "package" from Evolve that had a lot of books for future classes as well. Second semester we have one book to buy for $37. BSNtobe2009 works as a full-time student. I'm glad you posted that because I about passed out. Yes, several of ours we will be able to use throughout--dictionaries, drug guides, and only one text do we use for the 2 and 4 semesters. Many of ours come with CDs too, one of them is simple a CD interactive tutorial of some sort. I just got so overwhelmed looking at that list--kinda a reality check for me! Megsd works as a Clinical Nurse. I spent almost $1000 on books for my first term, but only need to spend about $150 so far for second term. Many of my books are being reused and disgustingly a few of the books I bought for the fall we never even touched. Hopefully we will use those in future terms as well. you could probably skip half the books on the list. much easier to cut and paste. I know some people wish to build a professional library, which is fine. But in all honesty, using a drug book that's even only a year old will get you in trouble with drugs taken off the market. I use Epocrates, which has a free drug book program for PDA's. Everytime I sync my Palm with my PC, it goes to Epocrates and upgrades to the most current information available. You can get a PDA for under $100. Drug book costs $40-$50 and is out of date in less than a year. So spend if you want. But you don't really have to. what are you going to do when you need information on a diagnosis which is not on the online list? and, also, how can you advise someone to skip half the books on a list when you don't know what books are even on the list? 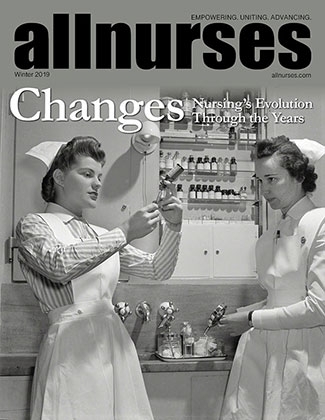 collegebound. . .take the advice of a 30-year veteran of nursing. every dictionary, drug guide and care plan book is important to have. these are not purchases that you are going to make every semester. they are one time purchases. i have replaced a good number of these kinds of books over the years (good to update about every 10 years or so) for my own personal library and i'm no longer a nursing student. there are times when i would come home from work and need to look something up because we just didn't have a reference for it at work. or, someone in your life will ask a question that will send you to your books looking for the answer. here's what reference books i recommend minimally: collegiate dictionary (not a pocket one), medical dictionary (not a pocket one), drug reference, lab/x-ray/test reference, a&p or pathophysiology, physical examination, fluid and electrolytes, and a book with all the nursing diagnoses defined. and, if you think the cost of nursing books is bad, you should see what the medical students have to pay! I do plan on buying all the books on my list--I am a total bookworm and have about three bookshelves stuffed!! I will take Jov's advice about the PDA, I have been researching them for awhile. I am inhereting my dad's but I don't know anything about it (how old it is, memory, etc) so I don't know if it will do the trick. If not I will invest in a new one--I think it is a great condensed research tool but I can't totally rely on technology so will get the books too! I know I mentioned the cost, which is frightening, but was really more frightened at the amount of time all those books imply. I knew NS would be time consuming and difficult but this really brought it home to me. Oh well, I will do what I have to do--I just hope I can see my girls grow up, LOL! Yes, the first semester of NS is especially expensive because your starting from ground zero as far as reference books and supplies go. They are a must (either in book or PDA form). The following semesters are not as bad because you already have most of your supplies (books, uniforms, steths, etc.). :yeahthat: My first semester my books cost more than my tuition!! Books were over 1100 bucks! And we were supposed to buy ATI (book/cd set) for 450! Luckily that got shoved back till next semester, but I almost fell over when I was done buying them! Check to buy em used!!! And keep em! you will need them! All the nurses on the floor we have clinical on ask to check out our books for stuff.. But this semester.. 2 books is all I need. Thank goodness!! Yeah and I had to laugh when I saw the extra page of 20 additional books that they reccomended!